After 2014, International whaling commission returned to Slovenia. Their 66th meeting of the Scientific Committee was held from 4 to 20 June 2016 in Bled. Around 200 of the world’s leading cetacean scientists gathered to discuss the latest research on a wide range of subjects related to cetacean conservation and management. Bled has thus become the only city to host the IWC meeting twice. The Ministry of Foreign Affairs and the Ministry of the Environment and Spatial Planning of Slovenia with the support of the Secretariat of the IWC and Sava Tourism d.d. co-hosted the opening of the 66th meeting of the Scientific Committee of the International Whaling Commission (IWC) on 7 June 2016 at Bled, Slovenia. This was one of the longest meetings Bled hosted. The event lasted a lengthy 13 days and hosted around 170 scientists. On the first day of the gathering fifteen sub-groups were formed and ran simultaneously, covering a wide variety of subjects, which ranged from ecosystem modelling and whalewatching to stock definition and aboriginal whaling management. Each sub-group produced a report that was reviewed at a concluding plenary session by the Scientific and Conservation Committees to later on provide advice to the Commission and help create a scientific foundation for IWC policy making. The host destination and Sava Tourism d.d. undertook the challenge of how to accommodate the guests and over almost two weeks on one hand keep them feeling like at home and on the other hand keep them amused and excited, with smile. The guests were accommodated in 4 hotels managed by Sava Hotels & Resorts; from 3- to 5-stars depending on the delegates’ budget and wishes. The main meeting venue was set up in Hotel Golf **** in Jupiter hall and a number of different Break-out rooms. The culinary offer prepared by the skilled chefs of Sava Hotels & Resorts pampered guests taste buds throughout the event. Last but not least, it was precisely the quality of the congress offer, Slovenian hospitality and the friendly staff what persuaded IWC to return to Bled. 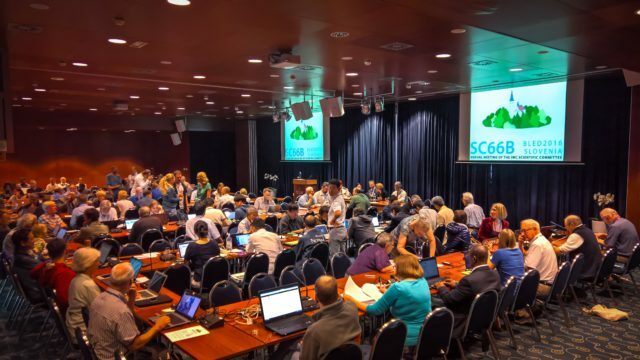 In October, Slovenia will also host the 66th IWC meeting in Portorož.